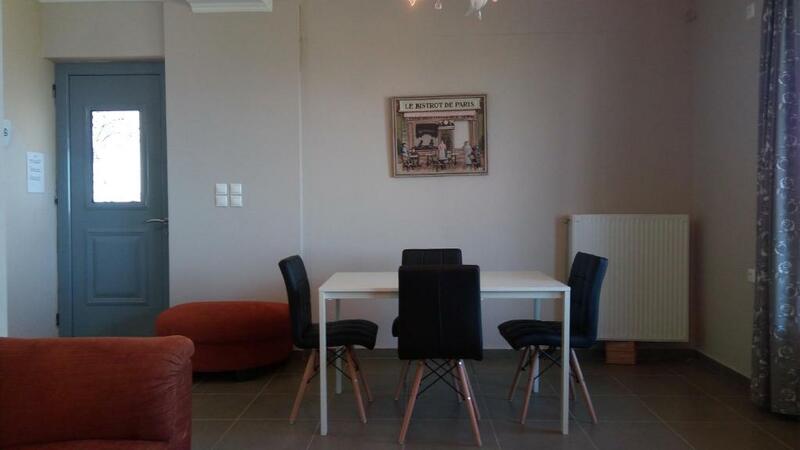 1 min from beach, very clean, all rooms in the apartment are really spacious, excellent for families, really fully equipped, big separate rooms, 2 bathrooms, bathroom inside the main room, terrace with a view and around the apartment, excellent wifi, apartment occupies whole floor. Really highly recommended. Great value for money. We strongly recommend this house to everyone! 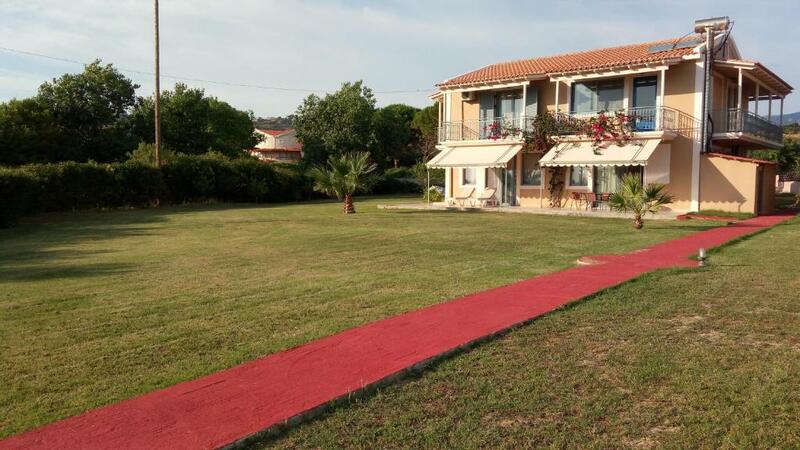 We loved the spacious garden in front of the house with an exceptional view towards the sea. We liked the beach that was two steps away and the amazing comfort that our host provided us with. He was very friendly and nice to us. The house was absolutely clean and tidy. It was a perfect home for our vacation. Overal we loved absolutely everything! 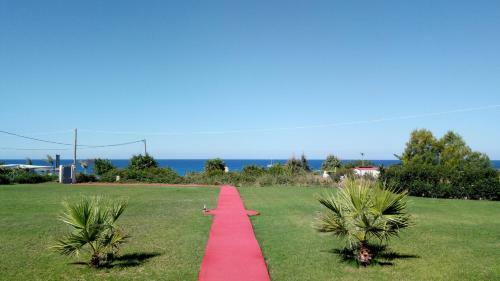 Definitely the best pick in Kefalonia - Ammes. Christoforoswas a great host, very friendly and helpful. I would certainly recommend his place. There was no problem checking in or out. The apartment had an aircon, everything was very clean and we really felt like at home! We really enjoyed the big garden with its equipment. 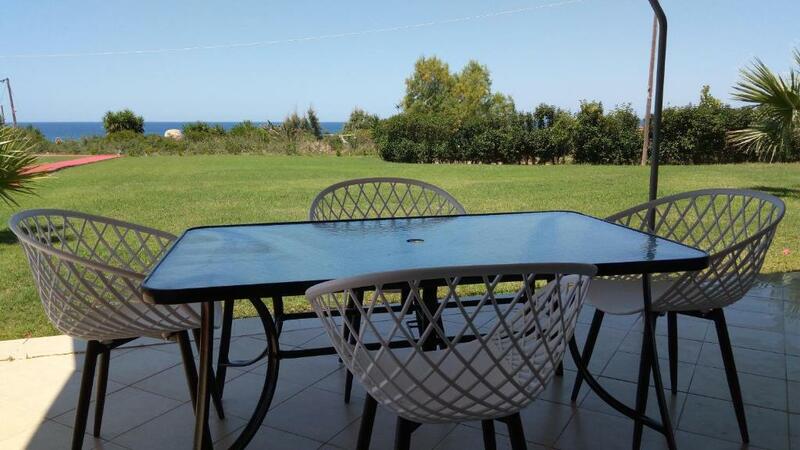 The location is ideal – 3 mins from very clean and calm beach and 2 mins from bus station from where you can go around the island. The place is located close by the airport, but planes did not disturb us at all (it is actually very interesting experience). I can only HIGHLY RECOMMEND! 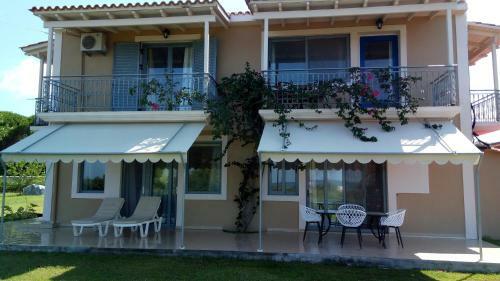 I love my vacations in silias, the house was beautiful and clean, 3 min from the beach and a nice restaurant. The area is quite but with easy access to rest of the island. But without any dought even better than all of this, was the host, Chistofos he made us feel at home, he help us since the moment we land on the island, and made us feel comfortable to ask for more help during our staying. A BIG thank you to him. So not only I recommend his place, as I would like to go back. Amazing apartment - even better than the pictures. The kitchen had every item you could possibly need, and more! It was spotless, spacious and comfortable, the wifi was a bonus that occupied the children in the evening.... The owner Christopher was so helpful, and could not have done more for us. He advised on buses, places to shop, things to do and lent us sun umbrellas and a Lilo for the children to use. He even offered to drive us to town... The beach is right outside the villa and is a lovely safe and clean place for children to swim. They spent the entire time snorkelling to see the fishes. There is a lovely atmosphere in the resort and local restaurants serving fantastic food - Greek dancing night should not be missed! I cannot recommend this highly enough to anyone who wants a beach holiday...we will be coming back! Posizione ottima. Vicinissimo ad una bella spiaggia. Molto ampio e con terrazzi intorno a tutto l'appartamento con vista e possibilità di colazione/pranzo/cena all'esterno in ombra ad ogni ora. Grande giardino e posto auto. Buoni ristoranti a brevissima distanza. La vicinanza dell'aeroporto (gli aerei atterrano praticamente davanti alla casa), inizialmente un poco inquietante, non si è rivelata poi così fastidiosa ma piuttosto curiosa e utile per i trasferimenti da/per i voli. Christoforos, il proprietario, estremamente gentile e disponibile. Quando torneremo a Cefalonia, sarà certo la nostra prima scelta. 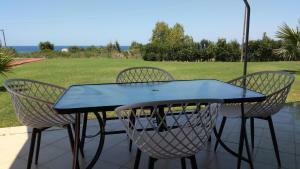 Lock in a great price for Silia – rated 9.7 by recent guests! 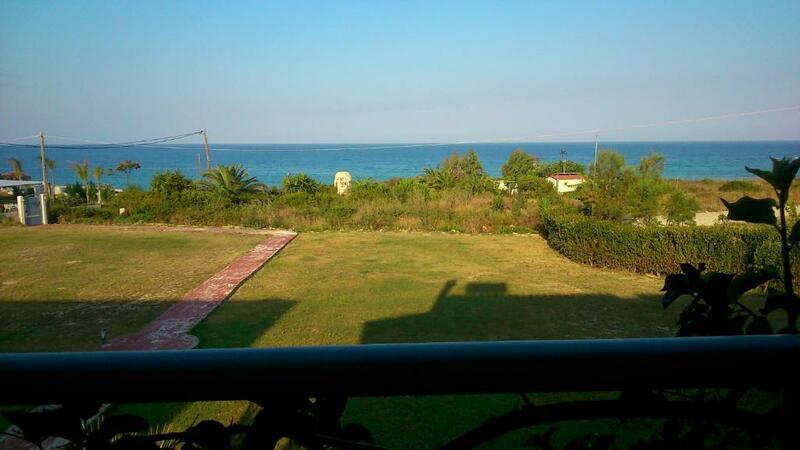 Silia is located just 100 feet away from the organized beach, Blue Flag beach Ammes Svoronaton. It offers fully equipped accommodations with sea view and free WiFi access. Located on first floor, Silia house consists of 2 separate bedrooms, a living room, separate kitcehn and 2 bathrooms. Facilities include a TV, air conditioning, fridge, and washing machine. It opens out to a garden and provides free private parking. Within 984 feet, you will find mini markets and restaurants, while at only 100 feet there is a snack bar. Ammes Beach are easily connected 4 times a day with a bus to the nearby beaches, the airport at 0.9 mi and Argostoli Town at 5.6 mi. When would you like to stay at Silia? Η παραθεριστική κατοικία βρίσκεται 30μ. πάνω από την οργανωμένη και βραβευμένη με μπλε σημαία παραλία Άμμες – Σβορωνάτων. Πρόκειται για ένα διαμπερές διαμέρισμα του 1ου ορόφου 100 τ.μ., με δύο υπνοδωμάτια, σαλόνι, αποθήκη, χωριστή κουζίνα και 2 μπάνια, που μπορεί να φιλοξενήσει 2-5 άτομα. Παρέχει τηλεόραση, κλιματισμό, ηλιακό θερμοσίφωνα, ψυγείο, πλυντήριο ρούχων, μπάνιο και wireless (internet). Βρίσκεται σε ένα χώρο με κήπο, πάρκινγκ και θέα στη θάλασσα. Σε κοντινή απόσταση θα βρείτε μοναδικές και οργανωμένες αμμώδεις παραλίες, όπως ο Αϊ Χέλης, τα Σπάσματα, η Άβυθος , η Πλατιά Άμμος και η Εγκλίνα. Στην περιοχή υπάρχουν στα 300μ. μίνι–μάρκετς και εστιατόρια, στα 30μ. σνακ-καφέ, επίσης σε απόσταση 1χλμ υπάρχει το λιμανάκι της Αγίας Πελαγίας με παροχές για τα σκάφη. Από την παραλία Άμμες υπάρχουν καθημερινά 4 δρομολόγια λεωφορείου προς τις κοντινές παραλίες, το αεροδρόμιο (1,5 χλμ.) και το Αργοστόλι (9 χλμ.). House Rules Silia takes special requests – add in the next step! Please inform Silia of your expected arrival time in advance. You can use the Special Requests box when booking, or contact the property directly using the contact details in your confirmation.